Perfectly simple, comfortable, and stylish. The Ryan top features a sloping, short kimono-sleeve yoke with gathered front and back bodice. 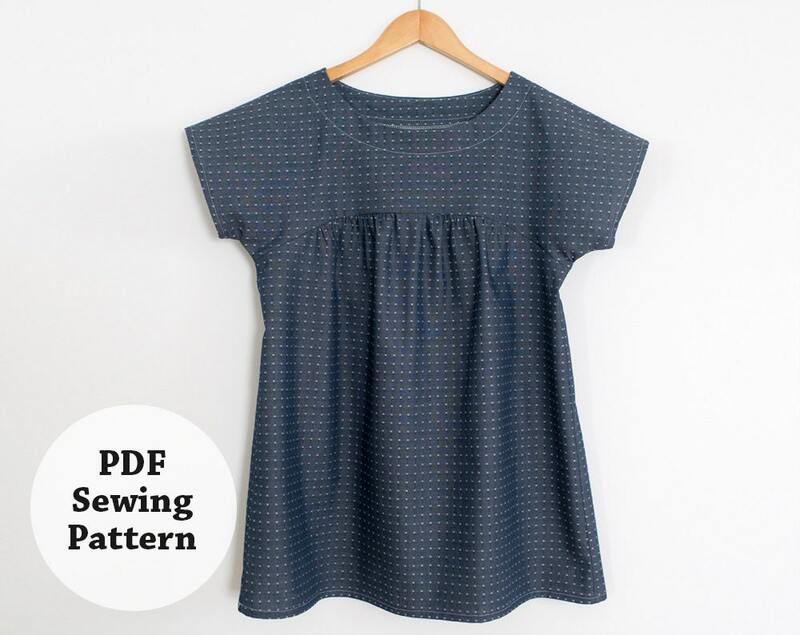 This top has minimal pieces which make it a snap to sew up! Intended for light-weight and medium-weight fabrics. Directions include full-color photos of entire process. This pattern available in sizes XS-XL. ALL RIGHTS RESERVED. No portion of this pattern may be photocopied or reproduced. Easy for a beginner sewer like me, and a style that is timeless. The instructions are very well done with alternate views as well, so helpful! I accept payment via paypal – all purchases must be paid within 24 hours. Due to the digital delivery of patterns, refunds are not available. If you have any questions concerning a pattern, please send them my way. I try to provide very clear and easy to follow directions so I'm always open to suggestions to making the patterns better. Thank you!